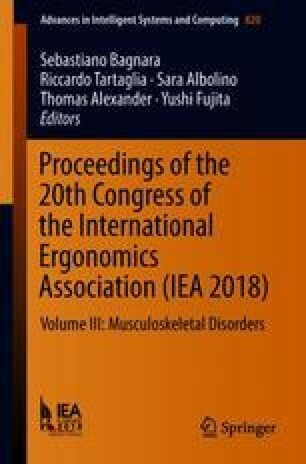 The goal of this study was to investigate the interactions between upper extremity and lower extremity in sitting postures. Ten healthy participants were recruited from the university population, and were asked to sit on a chair with six different lower extremity postures (2 trunk-thigh angles, 3 knee angles). The head, trunk and lower extremity postures were captured by using fourteen motion trackers, and used to calculate the head flexion angle, thoracic flexion angle, lumbar flexion angle, pelvic flexion angle, and shoulder angle. Results showed the effects of changes in the trunk-thigh angle and the knee angle on all dependent measures. First, the bigger trunk-thigh angle (135°) showed better lumbar lordosis, smaller head flexion angle, and less rounded shoulder as compared to the 90° trunk-thigh angle. In addition, the current study revealed that the bigger the trunk-thigh angle, the better the whole trunk postures including the better lumbar and thoracic lordosis, less flexed head, and less rounded shoulder. Second, the bigger knee flexion angle negatively influenced on all trunk posture measures, suggesting that the extended knee joint tightens hamstring muscles and pulls the pelvis backward, and finally results in the bad trunk posture such as less lordotic lumbar and thoracic postures, more head flexion angle and more rounded shoulder angle. On this basis, the office chair should be designed under the consideration of the lower extremity postures such as the position of foots, the knee supporter, and the seat inclination angle. This research was supported by the Basic Science Research Program through the National Research Foundation (NRF) of Korea funded by the Ministry of Education (NRF-2017R1D1A1B03035470).